I need your help to get our anti-austerity message out to the people of Ward 6! Our first piece is soon to go to print...and we need to raise money to pay for it and find volunteers to distribute it so that we can start to take an anti-austerity message door-to-door. A message centred around expanding public services, improved and free transit, a comprehensive housing strategy and higher wages! 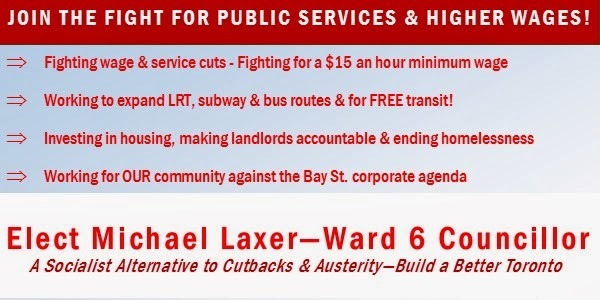 If you might have some time over the coming weeks to help us take the message door-to-door to the people of Ward 6, please email us at electmichaellaxer@outlook.com and we will get in touch! We have lots of doors to knock on and mailboxes to drop, so your help can allow us to get the message out! If you can help out with a donation, it will be greatly appreciated and put to immediate use! Or you can donate via Paypal or credit card by using the Donate button on the side. 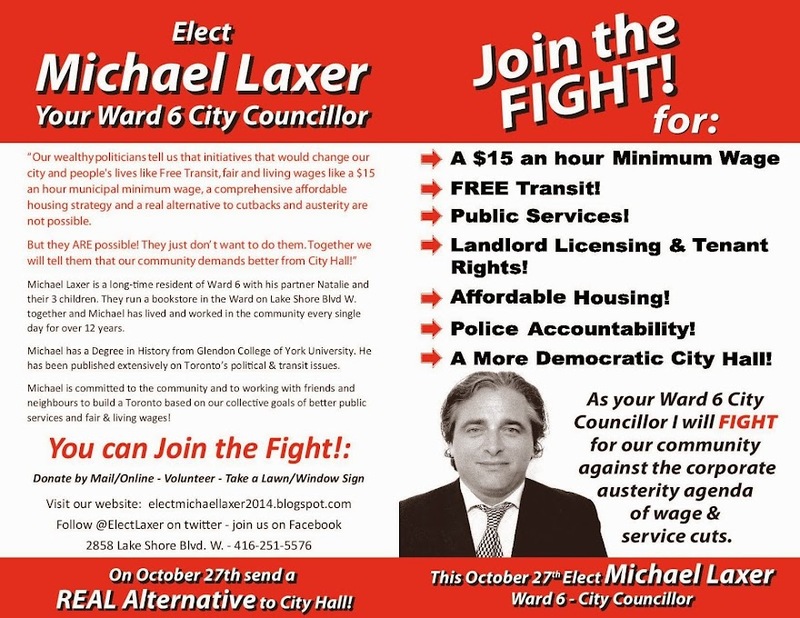 Elect Michael Laxer 2014 Candidate Card! 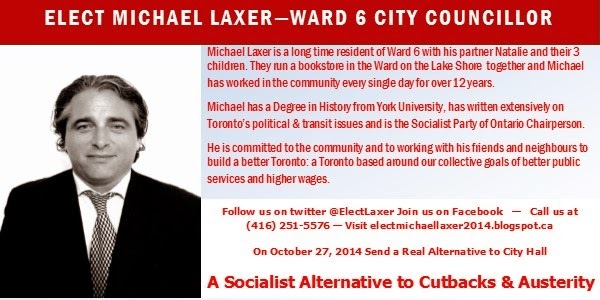 This is our first Elect Michael Laxer Candidate Card. Let me know what you think! Watch for our first consultative planning meeting announcement shortly. As a long-time resident of and small business person in Ward 6, and as a lifelong resident of Toronto, I am announcing today that I am running for election to seek to serve the people of Etobicoke Lakeshore Ward 6 as your City Councillor. I have lived in the Ward and worked on the Lakeshore every single day for over twelve years. I feel that, as a city and a society, our governments and many of our politicians have lost track of the principles of equality, justice and community that so many of us see as a fundamental part of what kind of a place we want to live in. The programs and freedoms that our foremothers and forefathers fought for are being sold off and whittled away on the altar of corporate greed in order to generate greater wealth for the already wealthy. We need to turn things around in Toronto. We need, together, to work towards a new direction for our city and its government. We need a real alternative. For too long we have been led by one version or another of austerity and cutbacks. Fewer services, lower wages, higher user fees, while the rich get richer and the city becomes impossible for many to afford to live in. For too long the agenda has been set by and for the rich, powerful and privileged, like Rob Ford, instead of by an agenda centred on the interests of the working people and residents of the city and Ward 6. 1) Economic Justice and Equality: We need a new Toronto. A more just and inclusive Toronto. A Toronto that leaves no resident behind. To do this we need the fight for economic justice to be front-and-centre and as a City Councillor I will fight to make higher wages a part of the business standards expected of retailers and businesses who wish to operate in the city, will actively fight for higher wages and benefits for all people and for stopping wage cuts for city workers or workers under contract to the city. Our city does not benefit by pushing the wages of any workers down. Instead we will fight together to raise the wages of all. I will actively advocate as a Councillor for a $15 an hour minimum wage in the city and province. 2) Transit: As Ward 6 City Councillor I will fight to see the Waterfront West LRT plan brought back to connect our Ward with Toronto's downtown in a faster and easier direct route. I will work to see transit expanded city wide and to have revenue tools put in place to finance and maintain this expansion. I will work to integrate GO Transit and TTC routes within the city so that people can use the Lakeshore line as if it was a subway. I will also fight against any agenda to raise fares and will work towards FREE transit, which should be the environmental and social goal of any government. 3) Housing: Toronto needs a serious housing strategy with the building of more co-op and community housing and fighting to get the province to implement stricter rent controls, especially in high rise and condo buildings. We need to bring in landlord licensing so that landlords who consistently fail to keep units in good repair and meet basic standards of conduct lose their right to be landlords. Public housing, which has been neglected and allowed to fall into disrepair over the past 20 years must be raised to a higher standard. We need to end homelessness in Toronto. Housing is a basic human right that needs to be made more affordable. Far too many Torontonians are homeless or one paycheque away from homelessness. This is unacceptable. We also need to continue the fight to abolish the pro-developer Ontario Municipal Board. 4) Police Accountability: The police in Toronto are meant to serve and protect ALL the citizens and residents of Toronto. There are simply too many cases where some police officers think and seem to be treated as if they are above the law. This has to stop. As a City Councillor I will work to fight for greater civilian oversight of the police and greater police accountability. No one should be above justice. 5) A More Democratic City Hall: For too long our City Hall has seen many of the same faces backed by the same interests. It is time for a more democratic City Hall, more open to change and new ideas and voices. For too long highly paid City Councillors have made cuts to the programs, wages and services that those making far less than they do depend on. As City Councillor I will fight to see term limits implemented, so that no Mayor or Councillor can serve more than two terms, to see stricter rules around campaign donations implemented, including limiting the ability of wealthy candidates to donate to themselves, and I will pledge to make no more in income than the average resident of the city does, donating the rest to charity and social causes. If City Councillors are going to make decisions affecting the lives of the people of the city, they should have to make ends meet on the wage of an average resident to truly understand the impact of their policies! 6) Fighting the Ford Austerity Agenda: When I ran in 2010 I was the only candidate in this Ward, and one of the few in the city, to stand up against Rob Ford publicly. His pathetic and dangerous personal behaviour aside, it was his agenda I most opposed. Together we need to fight this agenda, an agenda that goes beyond Rob Ford and that is the Capitalist agenda of service and wage cuts. We need a real and forceful Socialist alternative to this agenda. A Socialist alternative built around people and not profit, built around community and not the rich. This is just the start of our shared platform. There is so much to work towards in so many areas. As a candidate, and as a Councillor if elected, I will hold meetings every month open to all members of the community and anyone from anywhere in our city to get your input and your ideas for how we can, together, build a better, more equal and more just Toronto. A Toronto whose government is centred around our collective goal of ending injustice, inequality and oppression. A Toronto that will be known internationally not for a dangerously out-of-control reactionary mayor, but for its dedication to building a new society and a better world, starting right here in our own neighbourhoods and communities.